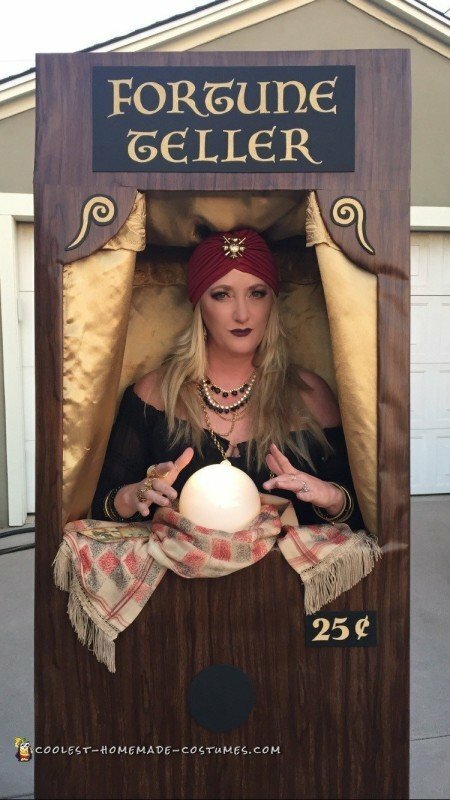 This “CARNIVAL FORTUNE TELLER MACHINE” Costume was relatively easy-to-make. The costume won first place in a costume contest! I decided to be a Fortune Teller for Halloween this year and wanted to go a step further than just wearing the outfit, so I created a costume that looked like a Fortune Teller in a Carnival Machine! 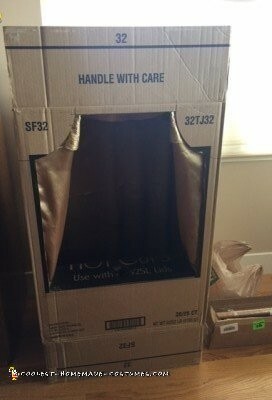 I got a large box (disposable cup box from Smart and Final), cut an opening in the front (top and sides of opening only), folded the cut piece into the box, creating a ledge in the process. I lined the interior of the box with gold satin fabric to look like curtains, then covered the exterior of the box with “wood grain” print wrapping paper (papermart.com) to make it look like a wooden machine. 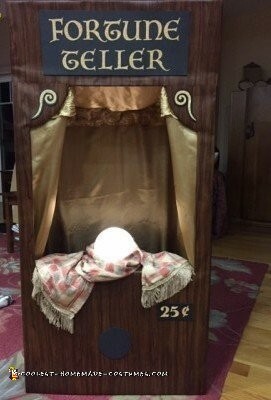 I purchased a white replacement light fixture globe and “push light” to put inside the globe to make the crystal ball and make it glow (both purchased at Home Depot). I cut an opening on the ledge in the box, pushed the base of the light fixture through the hole and taped the crystal ball in place. I covered the opening and ledge with an old fringed table runner, which was also taped in place so it wouldn’t move around. I traced and cut out letters from gold glitter paper and affixed them to the outside of the box with double-sided masking tape. I then dressed as a fortune teller and handed out funny fortunes that I had printed up before hand. The costume got a great reaction and won first place at an annual party I attended. It was really fun to wear!